When I started saving for my children's education, 529 Plans weren't yet introduced. So I saved within a UTMA/UGMA and then a Coverdell Education Savings Account. Each type of account seemed to have advantages and drawbacks. I wanted to save more for college in a designated account. But I had heard (more than once) that parents can't borrow money for their retirement in the way that children can borrow for their education. Eventually I came to realize that just because my retirement is a financial priority doesn't mean I couldn't set aside some money for my kids' education. Even if though I didn't save for the entire college experience — tuition, fees, room, board, books, study abroad, etc. — what I tucked away was extremely useful. The 529 Plan is officially a “qualified tuition plan.” There are two main types: prepaid tuition plans and college savings plans. 529 plans are sponsored by a state, state agency, or educational institution. Investment choices: Investment choices are limited to those developed by outside financial institutions for the plan sponsors. There are age-based mutual fund portfolios (similar to target-date retirement funds with asset allocations becoming more conservative as the date of college approaches); various index fund portfolios; and traditional savings accounts. States may sponsor plans but also allow parents to save with plans sponsored by other states. An adult (parent, grandparent, friend, relative, etc.) can open an account and serve as the account owner or participant. The account owner specifies the designated beneficiary, which is typically a child (the future student) but could also be a grandchild or even the account owner. Contributions: Initial contributions to open the account may be as low as $25. Plan designs vary but generally do not severely restrict the dollar amount of annual contributions. However, there are account maximums to make sure parents, grandparents, etc. don't over-save (and suffer tax consequences because it may be difficult to use all the money for qualified expenses). Such maximums are generally high, such as $200,000 or $400,000. Tax advantages: Earnings are not subject to federal taxes and possibly state taxes. Generally, withdrawals are tax-free as long as the money is used to pay for qualified higher education expenses. Such expenses include tuition, fees, books, and room and board within limits set by the student's college or university. Financial aid impact: Financial aid calculations are complex but 529 Plans tend to receive favorable treatment so that parents are not penalized for saving. For FAFSA (Free Application for Federal Student Aid), 529 Plan assets owned by parents are included as parental assets; only up to 5.64% of the plan's balance is considered for financial aid. Qualified plan distributions (when plans are owned by parents for their children) are not considered income. 529 Plans owned by grandparents are not included as family assets, but distributions from the plan are considered student income (impacting financial aid calculations in the year following a distribution). The Coverdell ESA provides a way for parents to save for their children's education within a tax-advantaged account, similar to the IRA (this account was formerly known as the Education IRA). Investment choices: The parent or account owner may control the investments within the account, which may include stocks, mutual funds, ETFs, and cash. Account ownership: Generally, a parent will set up the account and name a child under 18 as the beneficiary. The adult acts as a custodian of the account, making investment decisions and controlling use of its money to pay for college expenses. Contributions: Annual contributions are capped at $2,000 per year for each designated beneficiary (child under 18 years old). Parents, grandparents, aunts, and uncles may contribute to an account. However, those making contributions can not have a modified AGI (adjusted gross income) of more than $110,000 (or $220,000 if married filing jointly). Tax advantages: Earnings on contributions are not subject to federal taxes. Withdrawals can be made tax-free when the money is used to pay for qualified education expenses; such expenses include tuition, fees, books, and room and board within limits set by your college or university. Funds in the account can also pay for elementary and secondary school expenses without penalty, making the Coverdell ESA distinct from a 529 Plan. Financial aid impact: Coverdell ESAs are considered parental assets so a maximum of 5.64% of the account's balance is included for FAFSA financial aid calculations (similar to 529 Plans). An exception to this general rule occurs when the student owns the account and is NOT a dependent of the parent. Parents can set aside money for their children's college education using UTMA/UGMA accounts. Money is not restricted to education and can be applied to other purposes that benefit the child with the exception of parental obligations for food, clothing, and shelter. Investment choices: Investment choices are plentiful with these accounts. Parents can invest in stocks, bonds, etc. in both UTMA and UGMA accounts as well as other types of property within the UTMA account. Account ownership: The parent acts as the custodian for the account, making investment and spending decisions on behalf of the child. When the child reaches the age of majority (typically between 18 and 21 depending on the state), he or she takes control of the account. Contributions: There are no income restrictions on those making contributions and no caps on annual contributions or account maximums. However, parents might limit their contributions based on federal tax rules relating to gifts. Financial aid impact: For FAFSA financial aid purposes, the account is considered the child's assets. Generally, a child's assets are considered more heavily when determining the expected family contribution so money in an UTMA/UGMA can reduce financial aid packages more substantially than other savings methods (like the 529 Plan or Coverdell). A 529 Plan is similar to a Roth 401(k) and the Coverdell ESA, a Roth IRA. These plans don't offer federal tax deductions for contributions but allow you to grow your money tax-free (at least in terms of federal income taxes). Like a 401(k), a 529 Plan has few restrictions on making contributions but you have to choose from a menu of investment choices offered by the plan's sponsor. Like an IRA, the Coverdell ESA has contribution restrictions but the account owner has the freedom to pick stocks, mutual funds, etc. for the account. When my children were babies, there were no specialized college savings accounts. Initially, I put money into a UTMA/UGMA account and then later transferred money (on their behalf) to Coverdell ESAs. 529 Plans were introduced and developed in the late 1990s and early 2000s; the first 529 Plans offered by my state carried high fees and skimpy investment options. Today, plans seem to have better investment choices and are less costly. The nuances of these plans can be complex (for example, you can change 529 Plan beneficiaries but other accounts typically don't have this flexibility). Financial aid calculations are complicated and may vary by educational institution (though federal aid should be consistent, which is why I referenced FAFSA calculations); also, calculations may be different when your kid gets to college. Further, timing withdrawals could be synced with claiming of federal tax credits for education. 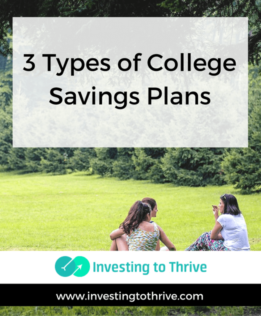 The important thing that I've come to understand is that saving for college expenses can benefit the entire family. Having money set aside can help ease the cash-flow crunch during the college years.